So, this book was an ok read. Story was decent and while Sophie Eastlake is an excellent female performer, her male voice is truly awful which really made it harder to listen to then it should have. Had they added a male narrator, it would have been a lot more enjoyable. Narration is great from Sophie Easlake where she makes where you don’t want to stop listening. 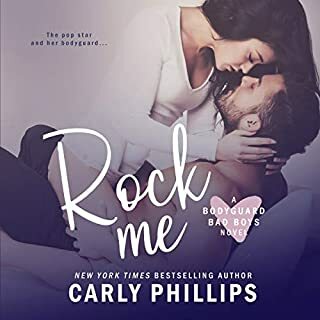 This was a great read once again by Carly Phillips and Erika Wilde, they never disappoint. Connor is a very dependable and reliable person when he gets stranded in Denver, because of a snow storm, he meets Katie and they have a one night stand, which Connor never has done. This was such as captivating story and getting to watch they story between Connor and Val the daughter he didn’t know he had was so adorable. Then watching the other characters being brought into the story in always like. I absolutely loved that this was a wonderful ending to the series. Stranded at an airport after being made a fool. To perfect strangers one glorious night. What a wonderfully written book. You will laugh and get angry and cry all at the same time. The one complaint I have is it ended too soon. But still a great big 5star rating. Every women's dream man. Loved the story, the characters and the great narrator. Definitely will be listening to these authors again. Thx for an amazing audiobook. This was such a sweet listen, I loved Connor & Katie...and Val! There’s just something about kids that makes me love an already sweet book even more! Always a fan of Carly Phillips and Erika Wilde. Narrator did a great job as well.